No matter if you are a teenager or an adult, the everyday things in life tend to stack up no matter what you do. For teenagers it could be the pressure of school, friends and or family. For adults, maybe it’s work, family, and or relationships. You will find the most obvious things are easily to list. However, what about those things that are less obvious? The things that stack up that not everyone can necessarily see. What are those “things” for YOU? How do you balance them? Let’s take a look at the things in your life that are stacking up: Create your list. As you review your list, think about how you balance each activity/thing. Do you have help? Do you delegate? Do you just let it overwhelm you? Now think about who you are balancing these things for. Is it for your parents? Your significant other? Is it for you? 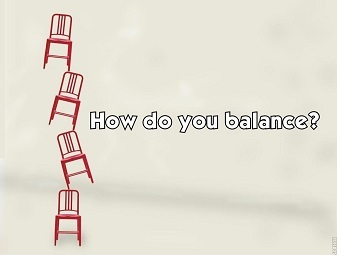 As things begin to stack up, the pressure of balancing will eventually hit you. How do you then react? Internalize? Externalize? Does it differ with the thing that you are dealing with? Knowing how you react to the things in life that you are trying to balance is the first step to your “self care”. Self care is simply that, “how you care for yourself” it’s the things you do to help you balance the everyday things in life that you’re faced with. Your self care plan may include: doing yoga, getting a massage, hanging out with friends, or taking a long bath, the list goes on. Learning how to prioritize your stack can also be part of your self care plan. Use whatever works best for you, calendars, set timers/alarms, etc. Also, remember to have a realistic time allotment for when you are scheduling. This will help to prevent any overbooking and not allowing the time you need for your self care. So how do you balance your stack of things? By knowing yourself, your self care plan and where you can draw support from. Remember that there is support for you, and you don’t necessarily have to do everything on your “list” alone.